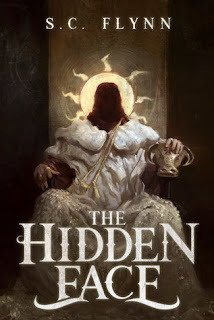 The Hidden Face by S.C. Flynn. The Hive, 2017. Ebook. 350 pages. Is it weird to say that I feel... winded after reading The Hidden Face? The reason I say that is because this book is an extremely adventurous, fast-paced story that I really had a fun time reading. And really, if you like fantasy that moves at a quick pace and throws plenty of action at you on almost every page, then you should really give this one a go. Flynn created a really interesting mythology for this world that I found myself actively engaged with and wanting to find out more about it. There is a lot of exposition regarding the mythology and how the characters are affected by it, but I didn't mind it too much because it was exposition that was actually engaging and did provide important information to the story. Included in the mythology are prophecies that do play a pretty large in the story. Prophecy being used as a plot point is a huge hit or miss for me these days, but I think Flynn did a good job of making it something that isn't overly cliche'd or awkward, but instead flows well with the narrative and plotline of the overall story. The two main characters, Dayraven and Sunniva, each bring plenty of motivation and intrigue to the story, and I appreciated getting to know each of them and their personality. Sunniva is your rather badass warrior woman who carries an air of confidence around her that I particularly enjoyed. Dayraven is a recently returned 'hostage' from an enemy city who comes across as somewhat lost in the beginning of the book, which is understandable considering he had been cut off from his hometown for the past fifteen years. As the story progresses, though, his confidence grows and more of his personality starts to emerge, leading to him becoming a rather endearing character. There are plenty of other characters involved (this is epic fantasy, of course), but the only other one I want to mention in this review is The Twister, who is one of the 'semi-mad' figures that steals whatever scene they are in. I really enjoyed reading his character and found myself rather partial to any scenes with him. The Hidden Face is riddled with puzzles and secret codes that must be solved by the characters, but is written in a way that actively engages the reader to solve at the same time. At times, I felt as if I was both reading and playing a game at the same time, which was really unique and also entertaining. I can see how people might dislike the in-depth puzzle solving, but at the same I thought it added a certain sort of authenticity and detail that improved the writing and showed the Flynn knows exactly what he is doing. There are too many books where characters just magically solve things without really allowing the reader to understand how they did it, so I really appreciated that aspect of this book. There were a few times when the dialogue and word choice in the narrative felt a bit awkward, which briefly jolted me out of the story. I'm not one that usually get too hung up on issues like this as long as they aren't overtaking my ability to enjoy the book, and fortunately this wasn't that bad. I also had a few issues with the worldbuilding, mainly that I wanted more of it. I feel like the world is explained fairly well, but I just couldn't quite get a good understanding of the entire world and how things worked. Overall, I've given The Hidden Face four stars and would certainly recommend it as a solid start to a new series! Thanks for reviewing! I am pleased you liked the book. This sounds very cool! Sometimes books that are so fast-paced with so much information can be overwhelming, but this sounds like it had a good flow.